Are you uncomfortable about going to a Realtor, or a lender because you don’t want to commit to something your not sure of? This live seminar will cover all the information you need to make an informed decision on whether the time is right for you, or not to buy a home. It’s short, live, and you can ask questions. Please join us for this no obligation first time event- you will be glad you did! Mortgage rates are moving higher amid a strong jobs report, bringing rates back to where they were at the start of 2015, according to the recently released results of Freddie Mac’s Primary Mortgage Market Survey. Results showed that the 30-year fixed-rate mortgage has averaged below 4 percent since the week ending November 13, 2014. The 30-year fixed-rate mortgage (FRM) averaged 3.86 percent with an average 0.6 point for the week ending March 12, 2015, up from the last week when it averaged 3.75 percent. A year ago at this time, the 30-year FRM averaged 4.37 percent. The 15-year FRM averaged 3.10 percent with an average 0.6 point, up from the previous week when it averaged 3.03 percent. A year ago at this time, the 15-year FRM averaged 3.38 percent. Results show the 5-year Treasury-indexed hybrid adjustable-rate mortgage (ARM) averaged 3.01 percent with an average 0.5 point, up from the last week when it averaged 2.96 percent. A year ago, the 5-year ARM averaged 3.09 percent. The 1-year Treasury-indexed ARM averaged 2.46 percent this week with an average 0.4 point, up from last week when it averaged 2.44 percent. At this time last year, the 1-year ARM averaged 2.48 percent. Phone Scams: Aggressive and threatening phone calls by criminals impersonating IRS agents remain an ongoing threat to taxpayers. The IRS has seen a surge of these phone scams in recent months as scam artists threaten police arrest, deportation, license revocation and other things. Identity Theft: Taxpayers need to watch out for identity theft, especially around tax time. The IRS is making progress on this front, but taxpayers still need to be extremely careful and do everything they can to avoid becoming a victim. Return Preparer Fraud: Taxpayers need to be on the lookout for unscrupulous return preparers. The vast majority of tax professionals provide honest, high-quality service. But there are some dishonest preparers who set up shop each filing season to perpetrate refund fraud, identity theft and other scams that hurt taxpayers. Fake Charities: Taxpayers should be on guard against groups masquerading as charitable organizations to attract donations from unsuspecting contributors. Contributors should take a few extra minutes to ensure their hard-earned money goes to legitimate and currently eligible charities. Note charities with names that are similar to familiar or nationally-known organizations. Abusive Tax Shelters: Taxpayers should avoid using abusive tax structures to avoid paying taxes. The vast majority of taxpayers pay their fair share, and everyone should be on the lookout for people peddling tax shelters that sound too good to be true. When in doubt, taxpayers should seek an independent opinion regarding complex products they are offered. I’m interested in seeing how many people go out in February to see the movie premier of ‘Fifty Shades of Gray,’ versus heading into their own homes to refinish interiors in countless shades of gray. That’s because Philadelphia’s Paint Quality Institute (PQI) for the second year in a row, is predicting gray to be the most popular hue for home interiors. This is the first time any color has headlined our forecast in back-to-back years, but gray, a near-perfect neutral color, has really caught on, according to a recent post on their website, paintquality.com. Institute experts say gray is very easy on the eyes, it’s understated and sophisticated, and most tints and shades of gray are ‘chameleon’ colors that change appearance when the light changes, so they provide enormous visual interest. Another reason for its popularity: Gray is a very versatile color that coordinates beautifully with a wide range of hues. As a result, it can be used in many different color schemes and with almost any style of décor. PQI experts say that pairing gray with one or more neutral colors—white, off-white, beige, taupe, soft blue, or black—can produce a tranquil color scheme capable of making an indoor space more relaxing. That’s why you may often see these combinations in areas of refuge and comfort, such as bedrooms and family rooms. But gray can also serve as an ideal foil for more adventurous color, ranging from saturated hues like purple, fuchsia, rust, and navy to softer tints like dusty pink and pale lavender. Color schemes employing these combinations can be used in virtually any room in the home. Where paint color is concerned, you can simply ask a counterperson about the color formula to find out whether the gray contains warm or cool elements, and let that guide your selection of companion colors. 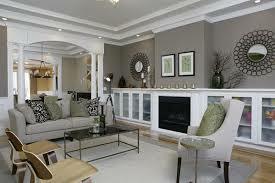 Warm or cool, gray is a great color for any interior. And the institute assures homeowners and decorators that it’s a color that will stand the test of time. Baking soda – Because it offers gentle abrasion, a little baking soda mixed with a few drops of water is an easy way to remove scuff marks from the floor or crayon from the wall or tabletop. Dip a rag into the paste and buff out the stain in a circular motion and watch the stain disappear. Extra virgin olive oil – The oil provides an easy way to shine up dull or streaky stainless steel or remove annoying stickers or price tags. For pots and pans, wash the finish with warm soapy water and buff dry, then pour a nickel-sized dab of oil on a paper towel and work into the steel for a smooth, polished shine. For sticker remnants, dab of bit of oil on the sticker and rub it in. Let it sit, then scrape off the sticker with a butter knife and remove the residue with soapy water and a clean cloth. Lemons – Got dirty white socks that won’t come clean? Boil a pot of water. Halve a lemon and squeeze in all the juice. Add the socks and simmer for an hour. The acid in the lemon will brighten the socks and whiten the stubborn dirt stains. Dry the socks in the dryer or in the sun for extra whitening power. Saliva – It may sound gross, but saliva contains enzymes that quickly break down blood stains. If you cut your finger and get a blood stain on your clothing, just spit on it, work it away with a clean cloth, and finish with a little soap and water. Denture tablets – These powerful little cleaners can remove the crusty water rings from inside your glass vases. Put room-temp water into the vase to just over the water line, drop in a denture tablet. When it finishes fizzing, pour it out, rinse the vase, and it will look like new. How many times have you seen the ads on television regarding choosing a Realtor? Did you know that not every real estate agent is a Realtor? The name “Realtor” is a registered trade mark, and only brokers who are members of the National Association of Realtors are legally allowed to call themselves Realtors. As a Realtor a broker agrees to abide by a strict “Code Of Ethics” that has been developed by the Association of Realtors for the protection of home buyers and sellers. Realtors support the housing industry and lobby from city through federal governments to protect the most valuable asset most people will ever own and keep the “American Dream” achievable. When you are ready to buy or sell your home, make sure that the broker is a Realtor. It’s the best way to assure that you get the best representation possible in the purchase or sale of your home.